Board of spervisors chairwoman Josie Gonzales’ past endorsement of her one-time board colleague Bill Postmus surfaced to complicate her current run for reelection, as her political foes have raised her association with Postmus and other local Republicans as a ploy to deny her the San Bernardino County Democratic Central Committee’s party endorsement. Gonzales is being challenged by Silvia Marroquin, of Fontana, and San Bernardino businessman John Taack, a Republican, in this year’s election for Fifth District supervisor. Gonzales was initially elected to the board of supervisors in 2004 and reelected without opposition in 2008, capturing 100 percent of the 14,972 votes cast in the Fifth District four years ago. While county supervisor is a non-partisan office, San Bernardino County is a particularly partisan county. The First, Second, Third and Fourth Districts are predominantly Republican areas. The Fifth District, which encompasses portions of Fontana and San Bernardino, and all of Bloomington, Rialto, and Colton, alone among the county’s districts is predominantly Democrat. Both Marroquin and Gonzales are Democrats. Previously, the incumbent Gonzales had assumed her party would automatically endorse her for reelection. But another Democrat. Gil Navarro, took exception with Gonzales’ past associations with Republican politicians, including former supervisors Bill Postmus and Paul Biane, who were also chairmen of the Republican Central Committee while each was serving as board chairman from, respectively, 2004 to 2006 and 2007 to 2009. Navarro, cited Section 9 of the San Bernardino County Democratic Central Committee’s by-laws, which states, “The SBCDCC (San Bernardino County Democratic Central Committee) shall also consider any resolution of “do not support” for candidates in nonpartisan races. Such resolution may be made by any SBCDCC member. The resolutions must be in writing and accompanied by documentary proof specifying the reason. The reasons must be limited to failure to uphold the platform of the Democratic Party or support by the candidates in question of non-Democrats in other races.” Navarro submitted accompanying evidence that Gonzales had supported both Postmus and Biane in their past political contests. The full Democratic Central Committee on April 26 turned back Navarro’s “do not support” resolution for Gonzales by a 14-13 margin. The resolution would have needed 60 percent passage to go into effect. The committee voted to endorse neither Gonzales nor Marroquin. Navarro referenced several Republicans Gonzales had endorsed, including Fontana Mayor Acquanetta Warren and Fontana Councilman Michael Tahan. It was her endorsements of former county Republican leaders Postmus and Biane that were most damaging and embarrassing, however, and not just because of party affiliation. Both Postmus and Biane were indicted in connection with accusations put forth by the county district attorney’s office and the state attorney general’s office that implicated them in an extortion and bribery plot relating to a November 2006 vote by the board of supervisors to confer a $102 million payment on the Colonies Partners development consortium to bring to a close a lawsuit that company had brought against the county over flood control issues at the Colonies at San Antonio and Colonies Crossroads residential and commercial subdivisions in northern Upland. Postmus has pleaded guilty to multiple felony charges contained in the first of those two indictments, including charges he solicited and received bribes from Jeff Burum, a co-managing principal in the Colonies Partners, in the form of two separate $50,000 contributions to political action committees he controlled. Biane was charged in a second superseding indictment related to that matter. He is accused of taking a $100,000 bribe from Burum in the form of a single $100,000 contribution to a political action committee he controlled with his former chief-of-staff, Matt Brown. Gonzales, in that November 2006 vote relating to the $102 million payment to the Colonies Partners, joined with then-supervisor Dennis Hansberger in opposing the settlement. Postmus, Biane and supervisor Gary Ovitt supported the payout. Ovitt’s then-chief-of-staff, Mark Kirk, likewise received a $100,000 contribution to his political action committee and was indicted along with Biane, Burum and Jim Erwin, a former county sheriff’s deputy union chief who was serving as a consultant to Burum. Burum, Biane, Erwin and Kirk have all pleaded not guilty. One of the pieces of proof that Navarro provided to the Democratic Central Committee in support of his resolution was a 2006 mailer sent out during Postmus’ run for assessor which contained a photo of Postmus and Gonzales together and Gonzales’s laudatory comments about Postmus. 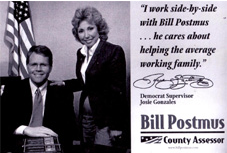 Josie Gonzales’ opponents dredged up this mailer from Bill Postmus’ 2006 campaign for county assessor to deny her the Democratic Party’s endorsement this year. It is not anticipated that the Democratic Central Committee’s failure to endorse Gonzales will have more than a marginal impact on the election’s outcome. As of the most recent filing period for campaign finance reporting on March 17, the incumbent Gonzalez had $877,123.33 in her campaign coffers. As of the same date, Marroquin and Taack had no money at all.